The Abundance Thanksgiving Menu EXTENDED until Nov. 30! We are introducing a new way to make it easy for you to have a delicious and sustainable Thanksgiving this year. If you order a turkey from us for, you’ll be able to select from a menu of housemade and prepared items. If you don’t want a turkey, be sure to check out what other holiday tastes we’re offering! 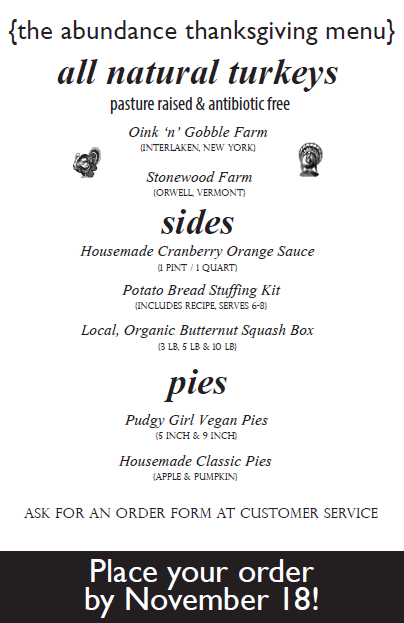 Buy a sustainably-raised turkey this year from Oink ‘n’ Gobble Farm (Interlaken, NY) or Stonewood Farm (Orwell, VT). How about Abundance housemade, all-natural cranberry orange relish made with New York cranberries? Get everything you need to make a tasty stuffing at home with everything ready to go in a simple it! We have a special butternut squash bundle, too! Add an Abundance housemade pie made from organic ingredients or a delightful vegan pie from Pudgy Girl Bakery to your order. You can place your order in-store. Simply tell a customer service representative or a cashier that you would like to make a Thanksgiving order. You will be given an Abundance Thanksgiving Menu form to fill out (pictured above). Just mark the items you’d like and we’ll take care of the rest! If you are ordering a turkey, a $10 deposit is due. Your order will be ready to pick up from 12:00 pm on Mon., Nov. 23 until we close on Weds., Nov. 25, 2015. Order must be placed by Fri., Oct. 30, Weds., Nov. 18, 2015!